An entire day dedicated to the bikini? Yes! Beacause, although there are lots of swimsuit varieties, the bikini is perhaps the most revealing swimsuit on the market. But what are the origins of this iconic beachwear? According to history.com, the first bikini was created in 1946 by French clothing designer Louis Reard. It was named after the Bikini Atoll where a headline about atomic testing had taken place the week before the bikini (suit) was revealed. When the bikini exploded onto the post WWII fashion scene, two-piece bathing suits were already being worn; however, the modest top and shorts combo was subject to wartime rationing of fabrics, and the swimming suit industry had been halted by war-time Sea to beach invasions in Europe. Advertised as “smaller than the world’s smallest bathing suit,” the bra-like top and two connected triangle pieces of fabric for the bottom was made from 30 inches of fabric. Because it was so difficult for Reard to find a model willing to reveal his swimsuit, he turned to exotic dancer Micheline Bernardini from the Casino de Paris who was much more comfortable revealing her body for the promotion. 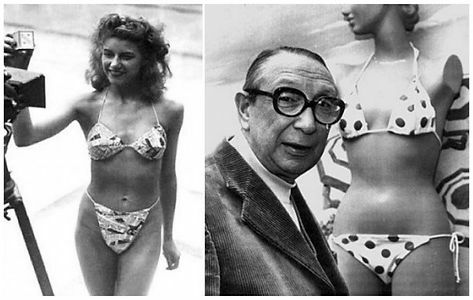 The reveal of the bikini was a hit that generated just as much fame for Bernardini as was generated for the swimsuit itself especially among men. 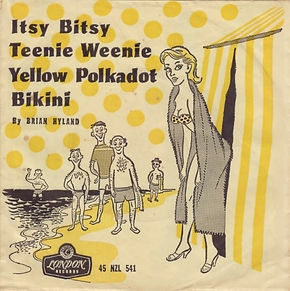 Anticipating the headlines the bikini would create, Reard stamped headlines into the design of the original bikini. Along the Mediterranean Coast, bikinis quickly became the “it” fashion and the trend grew throughout Europe. However, the growing trend was not without controversy as Spain and Italy passed legislation prohibiting the use of bikinis on public beaches. The pieces legislation were repealed in the 1950’s when the popularity of the bikini became the standard of beach fun and fashion.